What do you do when your summer excavation site turns out to be less than 5 miles from a war zone? The Ashkelon team had to figure matters out on the fly. Mark Hoffman is inviting everyone to join his free, online course, “Survey of the Lands of the Bible.” This MOOC begins in September and you can participate as much and as little as desired. Wayne Stiles has a well-written and well-illustrated article about Ein Parath, where Jeremiah buried his loincloth. How did archaeologists come to reject the biblical description of Joshua’s conquest? Henry Smith explains. He is interviewed briefly about the article here. Leon Mauldin takes his readers to the Mamertine Prison in Rome. ISIS Is About to Destroy Biblical History in Iraq. The latest issue of ‘Atiqot is online and it includes several articles about an excavation in the Kidron Valley. Göbekli Tepe excavator Klaus Schmidt died last week. Amnon Rosenfeld—In Memoriam, by Howard R. Feldman. A new museum has opened at Hisham’s palace (Khirbet al-Mafjar) in Jericho. A temple to the Urartian god Haldi has been discovered in northern Iraq. A painting from the tomb of a priest in the Old Kingdom was discovered near the Giza pyramids. You can read an update on the recent developments at the Temple Mount Sifting Project. The summary includes a series of photos of various sets of objects found. The Tel Burna team ended their season by taking photos from a helicopter drone. The post shows the whole process. Roman roads and milestones in Judaea and Palaestina are the focus of a new website produced by the Kinneret College on the Sea of Galilee and the Israeli Milestone Committee. Raphael Golb will spend two months in the slammer for his crimes of criminal impersonation and forgery. “The Archaeology of Music” is the subject on this week’s episode of The Book and the Spade. Biblical Archaeology Society has a summer sale, including the entire BAR Archive on DVD for $99.95. SourceFlix has posted a video taken by drone of the Old City and Temple Mount of Jerusalem. Excavators at Jezreel discovered an amethyst scarab that likely came from Jezebel’s homeland. Amnon Rosenfeld died in a car accident in Israel last week. Earlier this month he wrote “The Antiquities Game – Behind the Trial of the Century.” The article is long but has a number of valuable insights. With Gaza in the news again, Ferrell Jenkins discusses its biblical significance. The excavators at Gath had a very interesting day on Thursday. Abram K-J has found a free digital Greek edition of Eusebius’s Onomasticon. Rik Wadge and Steve Shermett host a series on biblical archaeology entitled Rocks, Shovels, and Manuscripts on God’s Learning Channel. The most recent episodes focus on the seven churches of Revelation. Caves in Israel—Manmade and God-made: Wayne Stiles explains and illustrates. He also offers a free download of a book he recently wrote for the Israel Ministry of Tourism, 100 Off-The-Beaten-Path Sites. The Baptist Press reports on this summer’s excavation at Gezer in light of the on-going conflict. Tensions and conflict between Hamas and Israel -- including Palestinian rocket-fire on Jerusalem and Tel Aviv and Israeli air strikes on Gaza -- have escalated in recent days. But Southwestern Baptist Theological Seminary's archaeological teams at Tel Gezer, located between Jerusalem and Tel Aviv, continue to work and unearth valuable historical data about the region. "Fortunately, our excavation camp and where we work are in low-populated areas, out of the target range and strategy of the rockets coming from Gaza," Steven Ortiz, professor of archaeology and biblical backgrounds at Southwestern Baptist Theological Seminary in Fort Worth, Texas, said. "Our dig house just happens to be a bomb shelter, so we have gone to the dig house when we heard the air raid sirens, and it is also open to other guests of the hotel and community," he said. "We are sensitive to all parties involved in the conflict, take every precaution and follow all directions from the Israeli government." The full article notes some of the recent progress, including this season’s excavation of a large building near the Solomonic gate. Luke Chandler has announced that the new Lachish expedition (fourth expedition) has found a new city gate on the northeastern side of the mound. Prof. Yosef Garfinkel states that current excavations at Tel Lachish have discovered a new, earlier entrance to the city on the northeast side of the tel. This is the opposite side of the mound from the known Iron Age gate. People who have visited Tel Lachish will recognize the Iron Age gate in the photo below. It lies on the southwest side of the tel and was discovered in the 1930′s by Starkey and Tufnell. This gate and its approach ramp relate to the city levels destroyed by Sennacherib of Assyria in 701 BC and Nebuchadnezzar of Babylon in 587/6 BC. Garfinkel believes the northeast section of the tel would have been a natural entrance point to the city in earlier times. The 2014 excavations exposed and clarified ancient fortifications in this area. Garfinkel gives the newly-discovered entrances a preliminary dating to the early Iron and Middle Bronze ages. (Biblically, this is the period ranging from the early kingdom years back to the Patriarchs.) The 2014 season at Lachish was cut short by the Israel-Hamas conflict, so these new entrances will be excavated in the 2015 season. If this is in fact a gate that can be dated to the "early Iron Age," then this is a very important discovery for reconstructing Israel/Judah's geopolitical character in the 10th and 9th centuries BCE. Until now the fortifications (or lack thereof) of Lachish levels V-IV (generally dated to the 10th-9th centuries BCE) had remained an open question. Everyone agrees that Lachish level III (c. 760-701 BCE) is securely dated to the time of Hezekiah and Sennacherib based on the abundance of LMLK seal impressions, the siege ramp, the Nineveh reliefs and the biblical/extrabiblical texts that discuss the battle. This layer is followed by Level II that is characterized by another destruction of Nebuchadnezzar at the beginning of the 6th century BCE. This too, is well-accepted by everyone due to its clear connection with the biblical and extrabiblical sources (e.g. Lachish letters). But the periods between the well-dated Late Bronze levels (e.g. fosse temples, summit temple, etc.) and the 8th-6th centuries BCE (Iron IIB-C) were not nearly as well understood in either the First (Starkey) or Third (Ussishkin) major expeditions at the site. It would allow for a better synthesis with parallels of other currently excavated sites. For example, this is very significant for Tel Burna, the site that I excavate at, since we have a casemate fortification that dates at least to the late Iron IIA (9th century BCE) if not earlier (we have not reached the base of the wall yet). We have always thought that our site is under the direct control of Lachish during this period and now it seems that there may be a physical connection. It would make for a very important point of comparison of the fortifications and related finds at such sites as Tel Sheva, Arad, Tel Erani, Beth-Shemesh. This is also huge (!) for archaeological survey material, which has long used the sequencing at Lachish as the basis for dating ceramic finds at other sites (e.g. 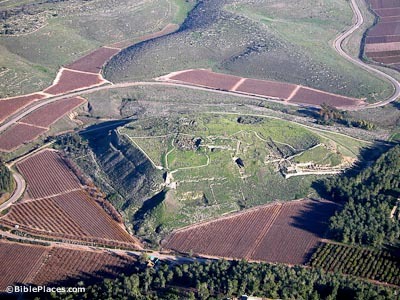 Yehuda Dagan - Shephelah Survey). It would show that early divided Judah or a united Israel was actively building in the Shephelah at the most important site in the region. This has major effects upon our interpretation on the nature of the massive city-state of Philistine Gath in relation to Judah, our reconstruction of Judah's rise as a territorial state, and our overall understanding of the borders and hinterlands of Judah in the 10th-9th centuries BCE. To put this in perspective, here are 3 major articles that have been devoted to this topic in the last couple of years (e.g. Na'aman 2013, Sergi 2013 (and dissertation), Lehmann and Niemann 2014). Not to mention that my own dissertation will largely be devoted to addressing this very question. It would aid in determining the historical reliability of the Rehoboam fortification list of cities in 2 Chronicles 11:5-12, which includes the city of Lachish. Rehoboam lived in the late 10th century BCE, but this list is often dated to the time of Hezekiah, or even to the Hasmonean period (!) by Finkelstein. These are just a few ramifications. If this in fact a gate, and it can in fact be dated to the "early Iron Age" (i.e. The Iron IIA) then it will have a major effect upon the field. Lachish from northwest - Iron IIB-C gates are on the right of the tell. New gate should be locate above the palatial podium (center of tell). According to Iraqi News, ISIL/ISIS terrorists destroyed what is believed by some to be the tomb of the prophet Jonah. 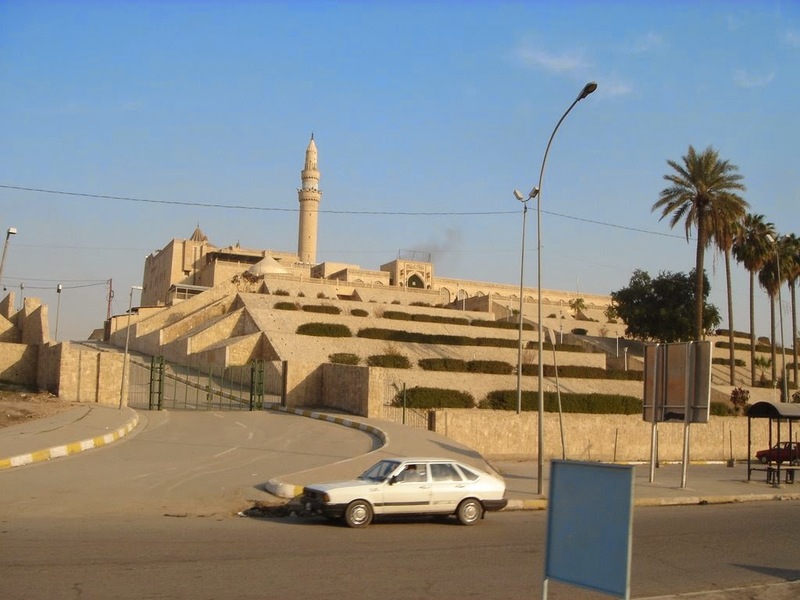 The mosque and tomb are located in modern Mosul, Iraq on Tell Nebi Yunus (Arabic for Prophet Jonah). The elements of ISIL controlled the mosque of the Prophet Younis in Mosul since they invaded the city...there is almost certain information stating the fact that the elements of ISIL dug up the grave of the Prophet Younis. They torched 11 churches and monasteries out of 35 scattered across the city of Mosul, and hours later destroyed statues of poets, literary and historical figures of which Mosul has long been proud. The full article with photographs and video is here. Tell Nebi Yunis in Mosul, Iraq. About 50 years or so after Jonah, Sennacherib (704-681 B.C.) enlarged Nineveh and made it his capital. The walls were 7.5 miles in circumference, had 15 gates, and enclosed two mounds: Tell Kuyunjik and Tell Nebi Yunus. 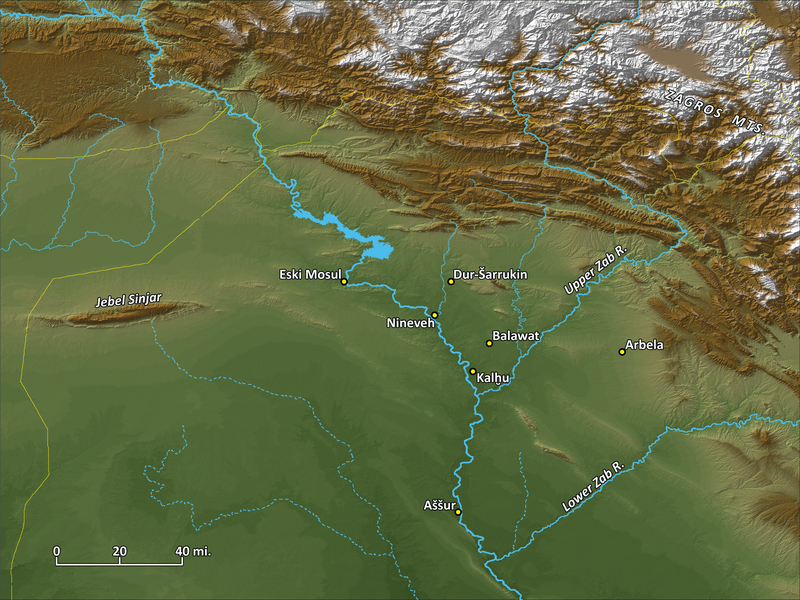 Here is a map of the Assyrian heartland, and here is a map of Nineveh in the time of Sennacherib. We wrote another piece about a shrine in Lebanon which commemorates the location where the fish spit Jonah out. You can read that here. Excavations led by a University of North Carolina at Chapel Hill faculty member revealed stunning new mosaics decorating the floor of the Late Roman (fifth century) synagogue at Huqoq, an ancient Jewish village in Israel’s Lower Galilee. In 2012, a mosaic showing Samson and the foxes (as related in the Bible’s Judges 15:4) was discovered in the synagogue’s east aisle. Last summer (2013), a second mosaic was found which shows Samson carrying the gate of Gaza on his shoulders (Judges 16:3). A third mosaic discovered in the synagogue’s east aisle is divided into three horizontal registers (strips), and differs in style, quality and content from the Samson scenes. It is the first time a non-biblical story has been found decorating any ancient synagogue. Portions of this mosaic were uncovered in 2013, and the rest was revealed this summer. The lowest register shows a bull pierced by spears, with blood gushing from his wounds, and a dying or dead soldier holding a shield. The middle register depicts an arcade, with the arches framing young men arranged around a seated elderly man holding a scroll, and lighted oil lamps above each arch. The uppermost register depicts a meeting between two large male figures. A bearded, diademed soldier wearing elaborate battle dress and a purple cloak is leading a large bull by the horns, accompanied by a phalanx of soldiers and elephants with shields tied to their sides. He is meeting with a grey-haired, bearded elderly man wearing a ceremonial white tunic and mantle, accompanied by young men with sheathed swords, also wearing ceremonial white tunics and mantles. The identification of the figures in this mosaic is unclear because there are no stories in the Hebrew Bible involving elephants, Magness said. The press release includes a small photo. A photo of the elephant can be seen in Magness’s article in Biblical Archaeology Review last year. Huqoq is located several miles west of Capernaum. In response to a post last week in which we mentioned the book Roads of Arabia: Archaeology and History of the Kingdom of Saudi Arabia, Harry Orenstein has alerted us to the existence of a pdf of the volume. The file (22.2 MB) can be downloaded from the website of the Saudi Commission for Tourism and Antiquities using the last link on this page. It is a pdf of the English version of Roads of Arabia. The quality of the images has been degraded, so the pdf does not replace the printed book, but it does make the volume searchable and much easier to move around.